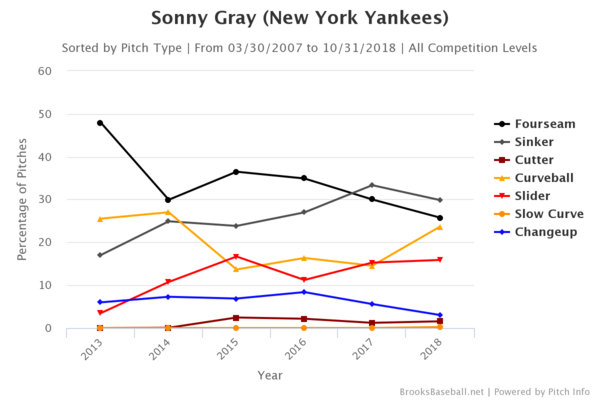 I’m a big fan of Gray; I was ecstatic when they traded for him, and I’m excited to see what he can do in a full season for the Yankees. There were some warts on his shiny ERA following the trade, and I can understand why he is viewed as something of a question mark heading into 2018. 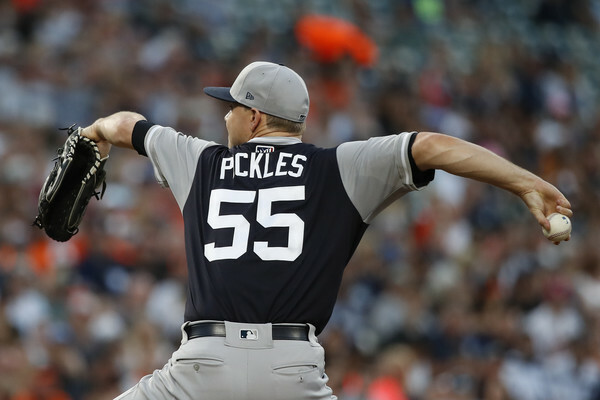 At the same time, though, he is a 28-year-old starter that has pitched like an ace at times, and has a fantastic repertoire – and he’s only really expected to be the team’s third starter. And there aren’t many – if any – better third starters in the game. There was more than a bit of skepticism towards that stance, and the early returns this season made supporting Gray seem a fool’s errand. But, as Kurt Vonnegut wrote in The Sirens of Titan, “anybody who has traveled this far on a fool’s errand has no choice but to uphold the honor of fools by completing the errand.” And so I held out hope as bad starts mounted and trade winds swirled, appearing more and more foolish by the week. But I digress. Let’s go back to the beginning. Gray exited his first start with some superficially tremendous numbers – notably a 2.25 ERA and 18.0 K/9. However, as was the case in his three months with the Yankees in 2018, his underlying numbers weren’t so hot. Gray only completed four innings due to an excessive pitch count (89), and he allowed seven hits and three walks along the way. He was pulled by Aaron Boone with one on and none out in the bottom of the fifth (an understandable and smart hook for the rookie manager), and was bailed out by Chad Green. It’s difficult to take a great deal away from one start, but the walks and pitch count were endemic of the issues that made fans leery when he first donned pinstripes. And, as a fun bit of foreshadowing, here is where I’ll note that he threw just 6.74% four-seamers in that start – the lowest figure of his career. In lieu of offering a start-by-start breakdown, I think that a simple list is all that you need to see in order to understand just how up-and-down Gray was this year. I won’t overload it with information, either – it’ll just be two numbers: innings pitched and runs allowed. On August 2, it was announced that Gray would be moving to the bullpen in deference to the newly-acquired Lance Lynn, so this isn’t an arbitrary endpoint. This list simply ends when the Yankees grew tired of Gray’s inconsistency (and, in more plain terms, his 5.56 ERA through 21 starts). In this stretch, Gray allowed 4+ runs nine times, and failed to finish the fifth inning seven times, which means he was putting pressure on the bullpen on both fronts. And every time he showed flashes of his old self (such as his outings on June 1 and June 6), he came crashing back to earth shortly thereafter. Watching his first 21 starts felt almost sadistic, as he appeared out of sorts at all times. He couldn’t find the strike zone with any semblance of regularity, and when he did it always seemed to be thrown right down the middle. That has a degree of hyperbole to it, to be sure – but his 9.9% walk rate and 14.1% HR/FB suggest that it rings at least a bit true. The fact that he averaged 85 pitches per start despite average fewer than 5 IP speaks to that, as well. Gray made his first relief appearance in extra innings against the White Sox on August 7 – and it was a good one. He tossed three scoreless innings and allowed just two base-runners, while striking out four, and picked up the win. He served as a swingman/long-man/long reliever from that point forward, and was more good than bad. Sure, he had two rough outings (including allowing 5 hits and 2 runs in an inning on August 12), but he finished out the season with a 2.35 ERA in his final nine appearances (26.2 IP). That included two spot-starts, which are a perfect exemplification of his season – 6.1 scoreless innings against the Orioles on August 25, and seven base-runners and three runs in three innings against the Twins on September 11. Gray finished the season with a 4.90 ERA (89 ERA+) and 4.17 FIP in 130.1 IP. It wasn’t his worst season – that distinction belongs to his injury-riddled 2016 – but his 9.8% walk rate was the worst of his career, as was his 50.0% groundball rate. Gray was all but unplayable in the Bronx, but he was a borderline ace on the road. There’s some noise in smaller sample sizes of this nature, of course – but this is basically just a more extreme version of how he performed with the Yankees in 2017. Interestingly enough, Gray’s two best and two worst starts came at home; make of that what you will. That trend started last year once he was acquired, and it continued this year. Gray threw just over 25% four-seamers this year, after being over 30% in each of his previous five seasons. That difference was made up for with his curveball usage, and that pitch was mediocre at-best; his slider, which is usually his best pitch, didn’t see that sort of uptick. It was a forced evolution, of sorts, and it was not effective. Gray has one year of arbitration eligibility left, and MLBTR projects a $9.1 MM salary. That is almost certainly moot, though, as Brian Cashman has indicated that Gray will be traded this off-season. So the only real question is who the Yankees can get in return. Fool me once, shame on you. Fool me twice, shame on me. So long, Sonny.